Age UK have published the Winter Newsletter which can be downloaded here discussing their Advice and Information Services (I&A), Tackling Isolation in Calderdale and much more. You can also make use of their free energy saving help and many other local services. This entry was posted in Jan, Staying Well and tagged Age Uk Calderdale & Kirklees. Age UK Calderdale and Kirklees are asking for your support this Christmas in various ways. Volunteers are needed for bucket collections, help with the Carol Concert and much more. See below for details. This entry was posted in Dec, Get Involved / Have Your Say, Staying Well and tagged Age Uk Calderdale & Kirklees. Are you looking for a way to share your time and give something back to the community? Age UK Calderdale and Kirklees are currently recruiting volunteer befrienders. 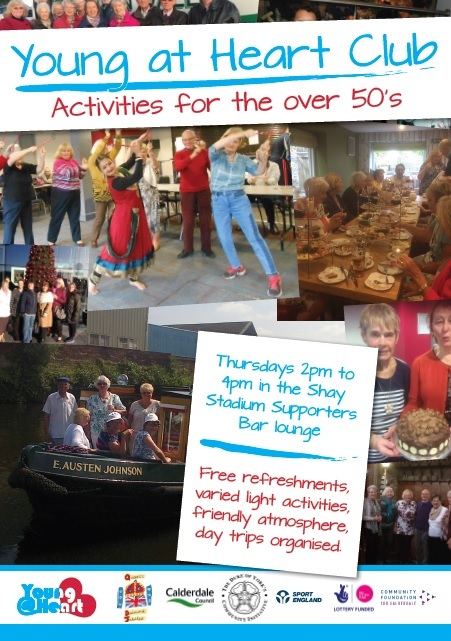 Join them in helping older people love later life through personalised activities, friendship and getting out and about. Contact Age UK Calderdale and Kirklees on 01422 252040 or email: enquiries@ageukck.org.uk for an application pack. This entry was posted in Get Involved / Have Your Say, Health, Staying Well and tagged Age Uk Calderdale & Kirklees. Join the Young @ Heart Club at the Shay Stadium on Thursdays, 2pm-4pm for varied light activities in a friendly atmosphere. The group caters to anyone over 50 who loves to have a good time and get involved in something fun with a bit of competition. This is one of the largest and most diverse groups in the area. Young @ Heart meet weekly at the Shay stadium in Halifax from 2pm each Thursday. Activities include – New age indoor kurling, Nintendo Wii games, Board games including dominoes and backgammon, table tennis and a darts board. They recently sent a team to the kurling regional championships in Lincolnshire where they came runner up. Young @ Heart has a working partnership with Age UK. This entry was posted in Health, Staying Well and tagged Age Uk Calderdale & Kirklees, Young at Heart. “Eatwell and Livewell” is a service that supports older people, identified as having nutritional issues, whose health may be suffering as a result of being at risk of becoming underweight. Age UK provide the service working alongside health professionals, including doctors, nurses and dietitians. Be underweight and identified as requiring support – or at potential risk due to frailty. Want to learn to eat more nourishing food in order to improve their health and quality of life. This entry was posted in Get Involved / Have Your Say and tagged Age Uk Calderdale & Kirklees, calderdale, Eat well & Live well, Get Involved, Health, Nutrition, Older People. This entry was posted in Brighouse, Elland, Get Involved / Have Your Say, Rastrick and tagged Age Uk, Age Uk Calderdale & Kirklees, Brighouse Library, calderdale, Calderdale Council, Calderdale Libraries, Elland Library, Get Involved, Rastrick Library, Training. Age UK have a limited fund to grant to older people to go on holiday who otherwise may not be able to afford it. The fund, made available by the Community Foundation for Calderdale, is now open and grants must be used by the end of the year (2016). The maximum grant is up to £500 / couple (£300 / individual) and is paid directly to the holiday company. Priority will be given to applicants who are aged 60+, live in the HX postcode area, who are in financial hardship, have a long term illness or disability and have not used the fund previously. The grants are available by submitting a simple application form to Age UK Calderdale and Kirklees. Completed form should be returned to the Woolshops and decisions will be made within 4 weeks. This entry was posted in Get Involved / Have Your Say and tagged Age Uk, Age Uk Calderdale & Kirklees, calderdale, Community Foundation for Calderdale, Get Involved, Grants, Halifax, Holiday Fund, Woolshops. Are you, or do you know of any older people who might benefit from supported access to a computer? Access to the internet has a number of benefits including shopping online and staying in touch with family & friends. Age UK may be able to offer FREE of charge – Loan of digital equipment, one to one support and more if you or someone you know is elderly or housebound. This entry was posted in Get Involved / Have Your Say and tagged Age Uk, Age Uk Calderdale & Kirklees, calderdale, Get Involved, Get Online at Home, Technology, Training. Learn your way around a computer with Digital Inclusion Information Technology classes every Wednesday at Pellon Network Centre from 10am to 12pm. Includes loan of IT equipment, tablets and laptops with WIFI and support from volunteers on assessment. If you would like to get involved and require further information call 01422 252040. This entry was posted in Brighouse, Elland, Get Involved / Have Your Say, Rastrick and tagged Age Uk, Age Uk Calderdale & Kirklees, Brighouse Library, calderdale, Calderdale Libraries, Digital Inclusion Programme, Elland Library, Get Involved, King Cross Library, Rastrick Library, Technology, Training. Age UK are looking for volunteer support for at least half a day per week to assist older people with their health and care needs and help them complete the Attendance Allowance claim form. Interview older people and their carers/ family about their health and care needs. Keep the client informed of the ‘next steps’ once the form is complete. Update a record of your visit on our electronic database, and liaise with Age UKCK staff in the office. Arrange visits to clients in their own homes keeping office staff informed and aware of your visits. Attend training and support sessions and provide at least one form filing session per week (approximately 2-3 hours). For volunteers visiting an older person at home you will need your own transport (your mileage will be paid), and you must be willing to undergo an enhanced DBS check. If you would like to make a difference within your community and feel that you are the right person for this role, please phone 01422 252040 and ask for Alison, or e mail enquiry@ageukck.org.uk. This entry was posted in Get Involved / Have Your Say and tagged Age Uk Calderdale & Kirklees, Get Involved, Volunteer.